Home » Why can't I add MP4 to PowerPoint for presentation? I am having problems playing an MP4 video on PowerPoint. When I use 'Insert movie from file' to try and insert an mp4 file, I get the following message "PowerPoint couldn't insert a movie from the selected file. Either the file is non-standard, or QuickTime is not properly installed." Why Can't Insert MP4 into PowerPoint? When working on PPT for use on a demonstration or class, the Office PowerPoint provides us a "Insert" function to add picture, music and video into PowerPoint slide. Many people like to add short videos to make the PPT more attractive. But the video format supported by PowerPoint is limited. The best formats that all PowerPoint versions can support are AVI and WMV, which are created by Microsoft itself. MP4, MOV, MKV, Flash videos are not accepted by PowerPoint 2007, 2003 or lower version. > You need have the QuickTime player installed on your computer and you can only insert an Apple QuickTime movie (.mov, .mp4) file to PPT 2010. > The PowerPoint 2010 64-bit version is not compatible with 32-bit versions of QuickTime. You must install a 64-bit version of QuickTime, or a 32-bit version of PowerPoint 2010. In PowerPoint 2013 and 2016, .mp4 videos encoded with H.264 video (a.k.a. MPEG-4 AVC) and AAC audio is recommended. If the source MP4 file doesn't meet the above requirement, PowerPoint won't play it. In order to successfully add and play any MP4 files on any version of PowerPoint, a recommended solution is convert MP4 to PowerPoint more compatible video format like WMV. In the guide below I'll show you how to transcode MP4 to WMV so that PowerPoint will like it. How to convert MP4 to WMV for embedding into PPT? Step 1. 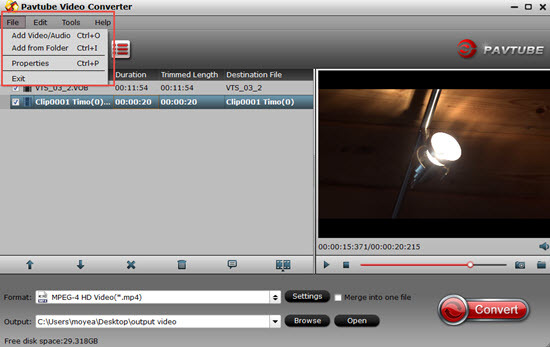 Run Pavtube Video Converter, drag and drop source MP4 file(s) to the software. Step 2. Click on “Format” bar, and select “PowerPoint>> WMV2 (*.wmv)” format from its drop-down profile list. Step 3. 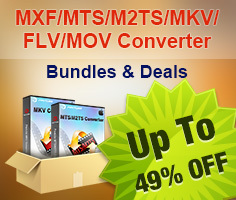 Press on the big “Convert” button to get Pavtube Video Converter convert MP4 to PowerPoint preferred WMV format. Step 4. After conversion you can press “Open” to locate resulting file. 1. Trim out unwanted frames: Press shortcut key “Ctrl” + “E” to enter video editor, where you can set starting and ending frame. 2. Combine 2 or more videos into one: Check the “Merge into one file” box before conversion. 3. Preview output file size/adjust video quality: Press on “Settings” to preview estimate file size. For better quality, set video bitrate up. Otherwise set video bitrate down to 2000kbps or below. How to add converted WMV file into PowerPoint? 1. In PowerPoint, select the slide that you’d insert video. 2. Click the "Insert" menu and select "Movies and Sounds." 3. Choose "Movie From File" and browse to locate the video you want to insert. 4. Double-click the WMV file you just saved. The video will now appear in the PowerPoint slide.